We're making good progress, but still have a lot of work to do in many locations. We have a full team working throughout the weekend and additional mutual aid crews have arrived today. 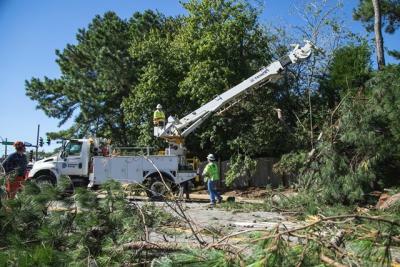 RICHMOND, Va., Oct. 13, 2018 /PRNewswire/ -- A workforce of more than 6,000 personnel, including Dominion Energy employees, contractors, and line workers on loan from neighboring utilities, is making substantial progress in restoring service in the aftermath of Tropical Storm Michael. As of 3 p.m. Saturday, we have restored service to nearly 80 percent of the 600,000 customers who lost power. Approximately 120,000 customers remain without service in hard-hit areas of central and southern Virginia, Hampton Roads, the Northern Neck and the Middle Peninsula. Michael's tornadic winds and torrential rain caused the sixth-largest outage in Dominion Energy history. At least seven confirmed tornadoes ripped through our service area Thursday evening into Friday. "Tropical Storm Michael caused severe damage across several regions in the state," said Ed Baine, senior vice president – Electric Distribution. "We're making good progress, but still have a lot of work to do in many locations. We are completely focused on restoring power to our customers as safely and quickly as possible. We have a full team working throughout the weekend and additional mutual aid crews arriving today." In preparation for this storm, we moved teams and equipment to locations where we expected the greatest impact within our service territory and brought in additional line crews and contractors to help from neighboring utilities. In total, we have off-system assistance from 12 states and Canada, with states as far away as Maine, Arkansas and Indiana. Dominion Energy expects to have the vast majority of customers restored by the end of the day on Monday and will focus on getting all schools back in service by early Monday. We expect to have individual restoration times for all customers on Sunday morning. Customers can call 1-866-366-4357 for an update or visit our online outage map at https://www.dominionenergy.com/outage-center/report-and-check-outages. As crews continue to uncover severe damage, restoration times may fluctuate. We continue to ask customers to be safe and exercise patience as we work through this multi-day outage.